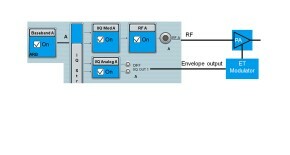 RF signal and the corresponding envelope signal. An increasing number of power amplifiers (PA) support the envelope tracking (ET) technology in order to improve efficiency and reduce power consumption, for example in smartphones and tactical radios. 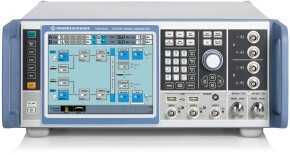 Typical test setups to measure PAs consist minimally of a signal generator and a spectrum analyzer. 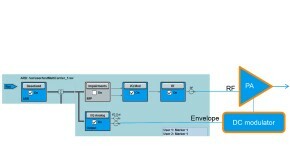 Envelope tracking requires an additional generator to provide the envelope signal for the DC modulator. Envelope signals demand highly precise adjustable time alignment with the RF signal, shaping capabilities and a signal performance with best spectral purity. R&S®SMW-K540 option: implemented shaping modes. 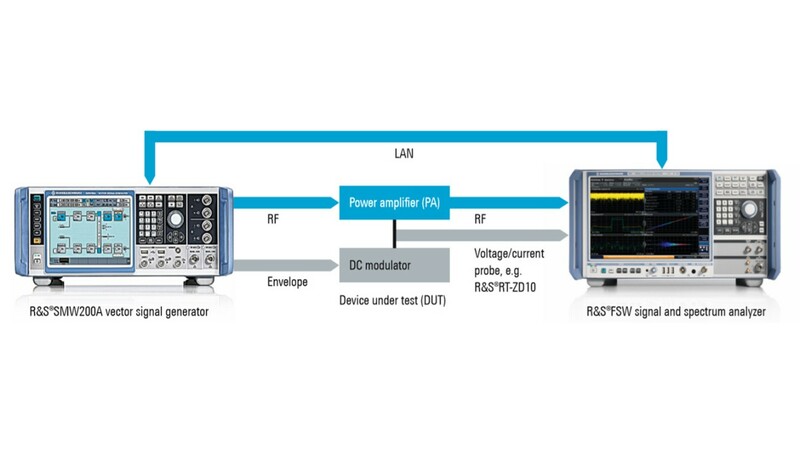 Rohde & Schwarz offers a compact solution for characterizing power amplifiers with envelope tracking using the R&S®SMW200A and the R&S®FSW. Equipped with the R&S®SMW-K540 envelope tracking option, the R&S®SMW200A generates both the RF signal and the corresponding envelope signal. Since the envelope signal is generated from the baseband signal in realtime, any userspecific I/Q file or wireless communications standard, such as LTE or WCDMA, can be used. 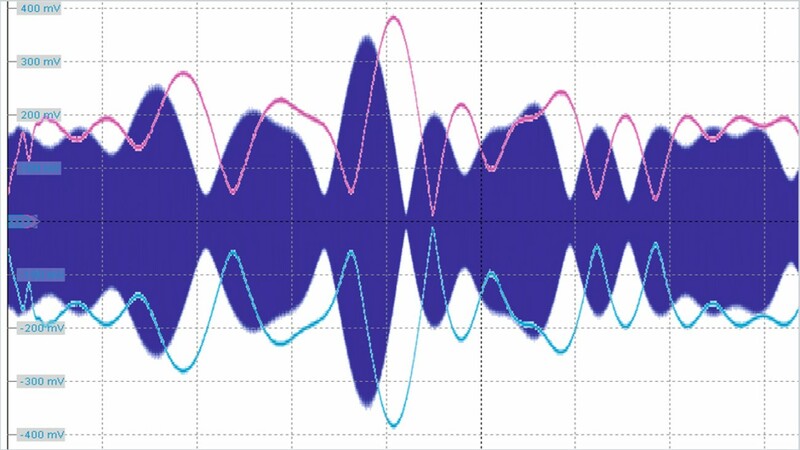 Generating the RF signal and the related envelope signal in a single instrument makes it possible to precisely adjust the delay between the two signals. The R&S®SMW200A adjusts the delay in ps steps within a range of ±1 μs in realtime, meeting tight requirements such as less than 1 ns for a 20 MHz LTE signal. 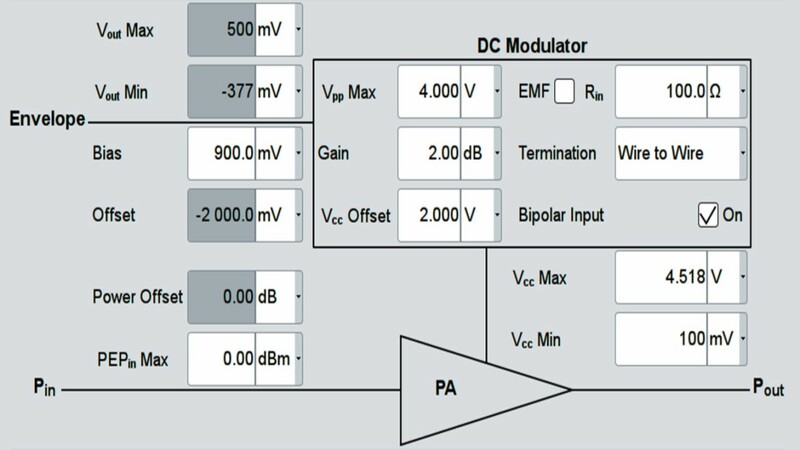 Shaping of the envelope signal is used to optimize the amplifier for efficiency or linearity. The R&S®SMW200A provides various shaping methods, such as table, polynomial and detroughing, which are applied in realtime. R&S®FSW-K18 option: full amplifier characterization in one measurement. 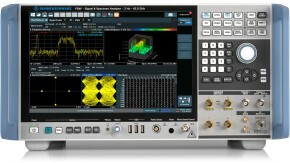 The R&S®FSW adds the analysis part of the ET test solution. The R&S®FSW-K18 amplifier measurement option fully characterizes any RF amplifier. 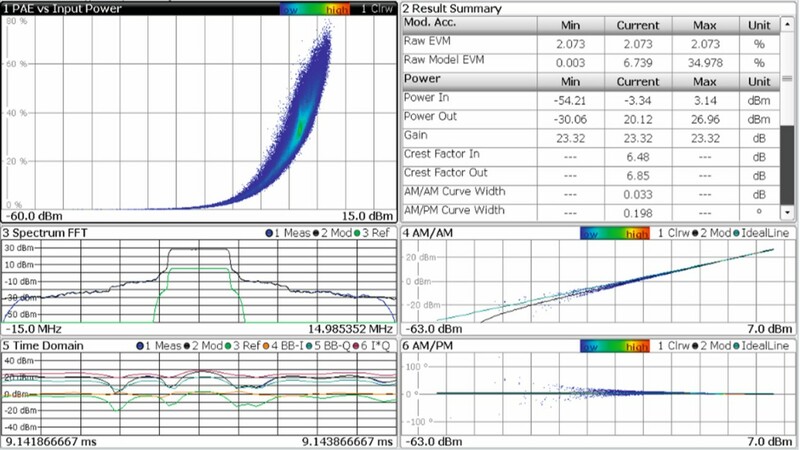 It analyzes typical RF parameters, such as gain compression, ACLR, EVM, AM/ AM and AM/PM distortion. Moreover, the R&S®FSW uses its baseband inputs to measure the supply voltage and current consumption of the PA while using the RF input to measure the RF signal. The simultaneously measured results are displayed in detailed tables and graphs providing the instantaneous PAE, i.e. the efficiency. With envelope tracking the amplifier is operated close to or even in saturation, which leads to distortion at the amplifier output. Therefore ET is often used together with digital predistortion (DPD) to compensate for this effect. The R&S®FSW-K18 can generate a DPD model from its distortion measurement. 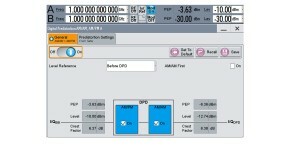 It automatically transfers the resulting DPD table to the R&S®SMW200A via LAN. 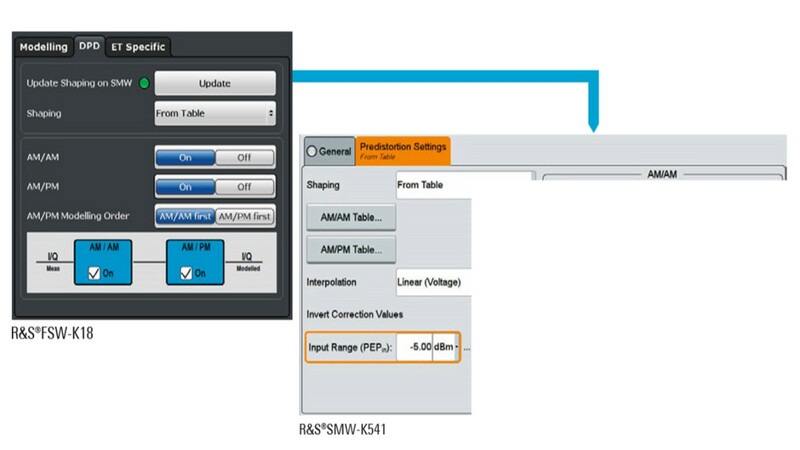 The R&S®FSW automatically transfers the measured DPD table to the R&S®SMW200A via LAN. The R&S®SMW-K541 digital predistortion option enables the R&S®SMW200A to apply realtime amplitude and phase corrections to each complex I/Q sample in line with the received DPD table. This enables the user to quickly verify the effect of predistortion, even for different power levels, without having to manually recalculate the original waveform file. The R&S®SMW200A equipped with R&S®SMW-K540 envelope tracking and R&S®SMW-K541 digital predistortion options in combination with the R&S®FSW equipped with the R&S®FSW-K18 amplifier measurements option provides a compact test solution that significantly simplifies the setup for adding envelope tracking to your power amplifier tests. 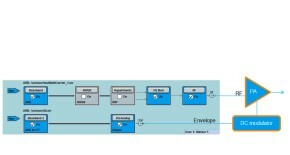 Compact Rohde&Schwarz setup for power amplifier tests including envelope tracking.